The other day I speak of the dark clouds. These are but dust very dense compressed, so dense that can not see the stars behind. 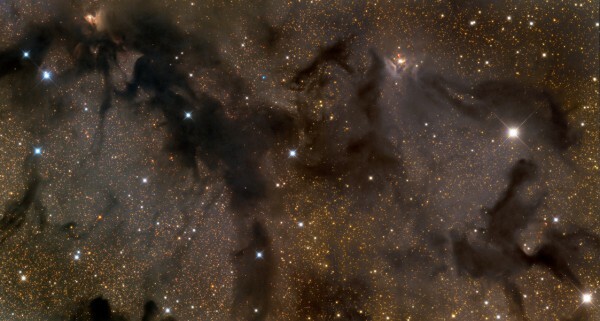 What you see are dark clouds in the constellation Aquila. Dust clouds are so dense that one can say that contain sufficient for the creation of thousands of star material. The dark area is called the LDN 673, while there are around stars ups and the RNO 109 nebula. The stars surrounding red, indicated by its brightness that are very young stars (remember that there is a method to know the age of the color of the stars according to their brightness, but we must remember that the refraction of our atmosphere tends to deceive , so the measurements are taken from the Hubble, mainly). These clouds of dark matter are about 800 light-years from here, come here next and it sure is exciting cross them and view the contents of them.